All of the student work was pulled together onto a Smore so that it could easily be shared with the world, and people voted for the Barrow Peace Prize via a Google form. Across 2 weeks, the student videos had 3,413 views, 1,161 likes, and visits from over 165 different locations around the world. A very special ceremony was held at our school to announce the 2016 Barrow Peace Prize winner. 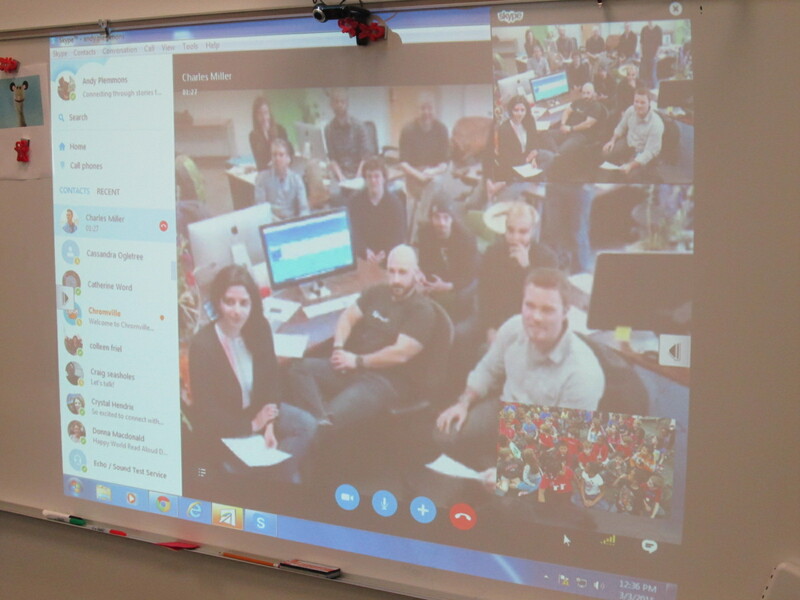 We typically Skype with the Flipgrid team to announce he winners, but this year when I called to plan our Skype, I was surprised to learn that the Flipgrid team had much bigger plans for this year’s ceremony. Charlie Miller and Brad Hosack, the creators of Flipgrid, flew down from Minnesota to join the celebration. They wanted the celebration to be like a mini Academy Awards. They rented a red carpet to roll out at the entrance to the library. They also bought enough pizza and drinks for all the kids, teachers, and families. In addition to the Barrow Peace Prize, we handed out special certificates to students which were chosen by teachers. The Flipgrid team also designed their own 3D printed award and gave it to 5 students chose by the entire Flipgrid team. Ahead of the event, the teachers sent out an RSVP invite to families so that we could get an estimate for chairs and pizza. We didn’t tell the kids very much about the ceremony except that they might want to dress up. The teachers all decided that they would dress for the Academy Awards, so I of course had to pull out my tux and red vest for the event. 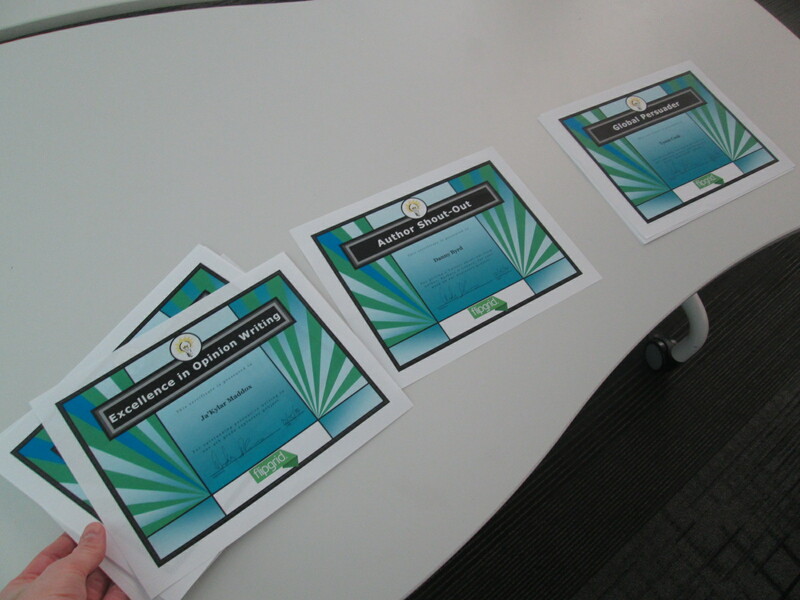 I printed out all of the certificates to hand to students and shared the doc with the Flipgrid team so that they could announce the winners. The day before the event, Charlie and Brad flew down. They took care of the red carpet, balloons, pizza, and drinks. Mr. Jordan, our student support technician, and I prepped the library. When Charlie and Brad arrived, we setup the red carpet with some spotlights and put out the balloons. The ceremony was the most special ceremony I’ve ever been a part of. The teachers, students, and families entered the library with movie theme music playing and took time to strike a pose on the red carpet for pictures. We also had many other special guests including Carol Williams for the CCSD Board of Education and Gretchen Thomas from UGA. The Flipgrid team gave students all of the statistics of their videos so that they heard the impact that their work was having around the world. Team members took turns announcing student winners in 5 categories, and students came up to receive their awards from the Minions with the help of my wife, Denise Plemmons. Prolific Persuader: For using multiple strategies to persuade your audience to vote for your person from history. Congratulations to Joshua, Ben, Kate, Copeland, and Cara. The Flipgrid Team handed out their unique 3D printed awards to Eli, Maggie, Iayah, and Zykurea. The thing that I loved the most is how excited kids were for one another as they received an award. Each winning name brought on a round of cheers and applause almost to the point that we couldn’t hear the next name being read. I love that this project brings students from multiple classrooms together through the common goal of celebrating a person from history. That teamwork that was a part of the entire project, we still evident as we celebrated one another at the ceremony. Students had a chance to ask the Flipgrid team questions. I always cherish this chance for students to step up to the camera and speak directly to the people who created the tools that they use. Students had such awesome questions such as “How do the videos we record get onto Flipgrid?” and “What are all of the jobs at Flipgrid?” The team took time to fully answer each question in the most personal and age-appropriate way. Jim Leslie, co-founder of Vidku, talked to the kids about how they were all as much a part of Flipgrid as the people who created it. He stressed the importance of student voice and how much of an impact these students have had on the people who work at Vidku and Flipgrid. Charlie Miller and Brad Hosack were able to arrive after the Minions left the building. Charlie talked to the kids about how tools like Flipgrid give every person an equal voice. 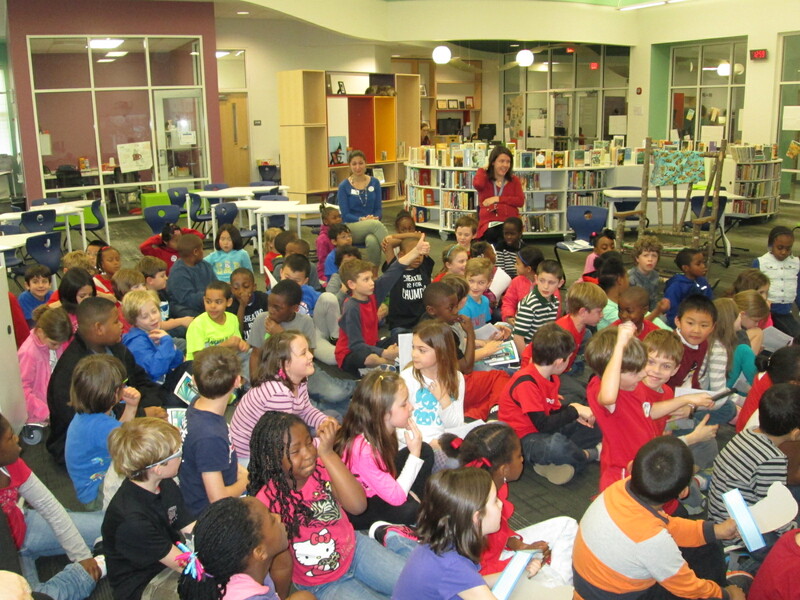 He emphasized to students how many thousands of people had viewed their videos and they are only 7 or 8 years old. He stressed that if you can have that kind of impact at such an early age, then imagine the impact you can have as you grow. The messages shared by Charlie, Brad, Jim, and the whole team are something that I stress to our kids every single day, but it was so powerful for students, teachers, families, board members, and other special guests to be in the same room together hearing this message from a company who truly cares about its users. At the very end of our ceremony, we announced the 2016 Barrow Peace Prize. We would like to give a big congratulations to Ruby Bridges for winning the 2016 Barrow Peace Prize. 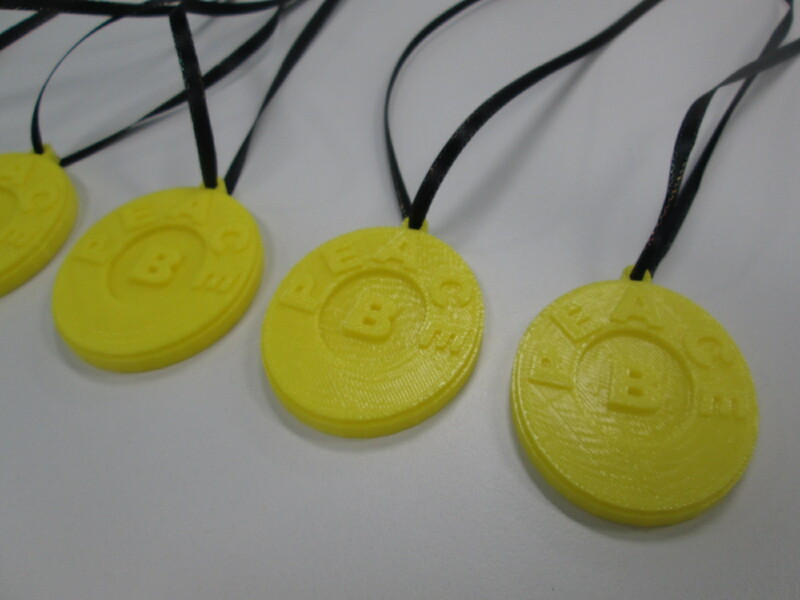 The 18 students who researched her received a copy of a 3D printed medal that was designed by 3 second grade students. 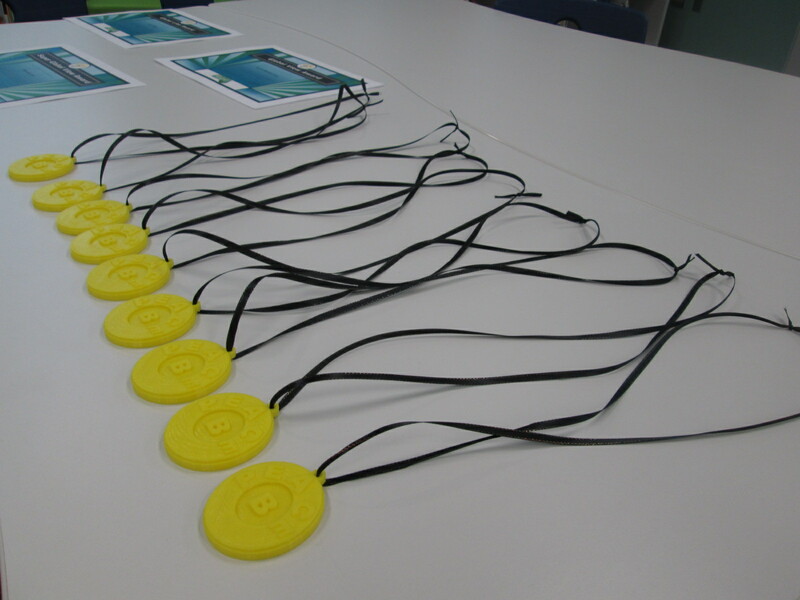 Each classroom also received a copy of the medal along with Charlie and Brad of Flipgrid. Afterward, I had several families come up to me and say that they had no idea what to expect at this ceremony, but they were blown away by the generosity of Flipgrid and the work of the students. So many students were celebrated, and families and students couldn’t help but smile and get excited. We enjoyed celebrating the winning videos by eating pizza. Students returned to their classrooms to watch more of the winning videos, which Brad pulled onto one grid for us. We can’t thank Charlie, Brad, and all of the Flipgrid and Vidku team for making our 2016 Barrow Peace Prize project the most memorable one so far. You are a company who listens to your users, celebrates their stories, and amplifies the impact students have on the world. Thank you. 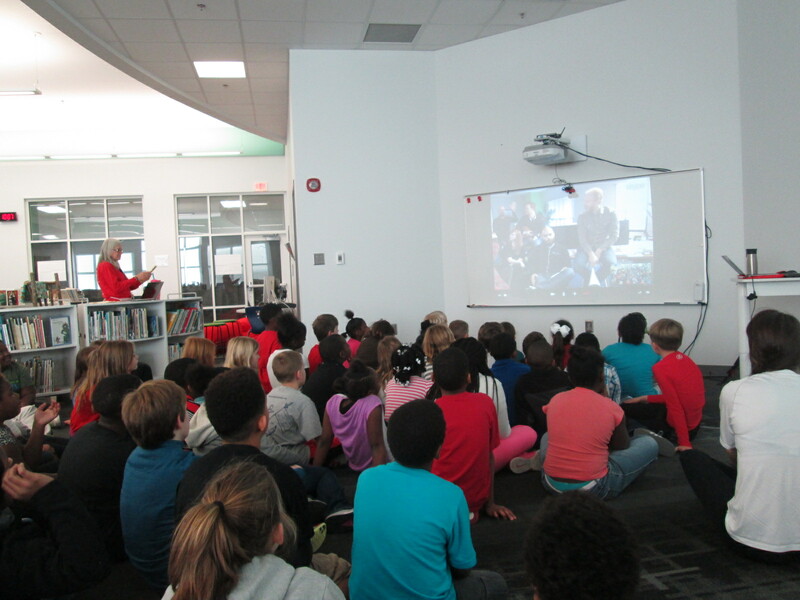 Today our 4th graders had the chance to Skype with Charlie Miller and the rest of the Flipgrid team in Minneapolis, Minnesota. This was the conclusion of the explorers project that 4th grade students have worked on for the past few weeks. As part of the project, we encouraged people around the world to watch our Flipgrid videos and vote on whether explorers were heroes or villains. Since this Skype came the week after our hour of code lessons, it was also a great time to hear about how an app was developed. It sounded like developing an app is a much longer process that developing a website because in one of the student questions we learned that the app took about 6 months to create while the website took 2 really long weekends. We also heard how an app is never really done because you are always trying to make it better. I loved how this connected both with our hour of code sessions but also to other areas such as writing instruction. Students also learned about how the name Flipgrid was chosen since the videos are on a grid and they flip when you play them, but they also heard other considerations that go into a name such as web domain registration and what is actually available. One of the most fun parts of the Skype was the announcement of awards. 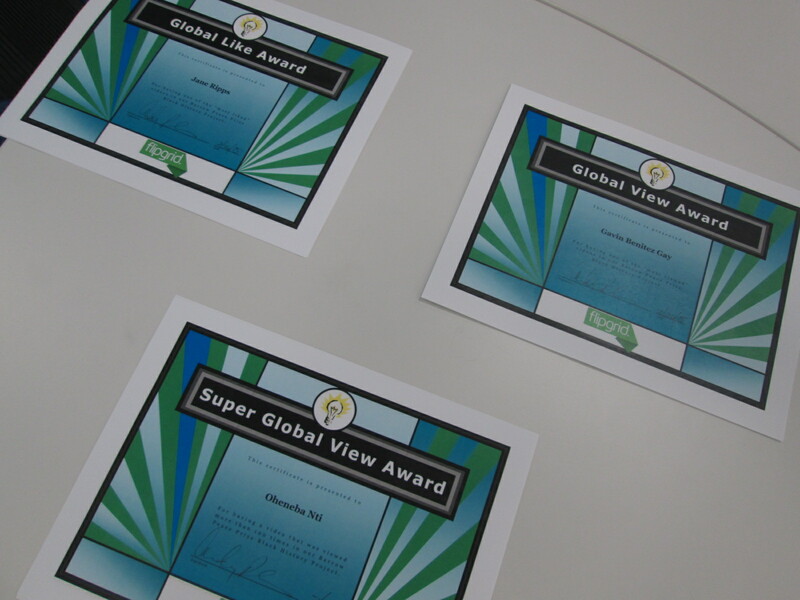 Several students received awards for Excellence in Writing, Shout-outs from authors, and Global Persuader awards. I sent these names to the Flipgrid team and they took turns calling out student names as I handed out the certificates. Students had fun giving silent cheers for their classmates as awards were handed out. I also took time to share with the students the results of all of the voting that had taken place for their project. It was interesting to see their reactions as they heard that Christopher Columbus was the only explorer voted to be a villain. Just for fun, we closed out our Skype with a Christmas singalong of Rudolph. Luke performed on the guitar and we belted out our best Rudolph even through the time delay on Skype. It may not have sounded like it was together, but it was still fun. Thank you to the entire Flipgrid team for creating a tool that has helped our student voices to reach a global audience, and thank you for taking time to celebrate with us.